What are the most popular lengths for baby names right now? 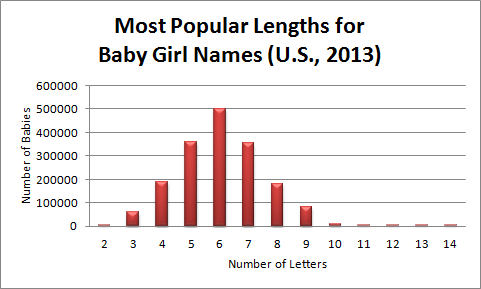 The most popular lengths for girl names: 6 letters, 5 letters, 7 letters. 2013 vs. 2012: 5 and 7 switched places. The most popular lengths for boy names: 6 letters, 5 letters, 7 letters. The most popular lengths for baby names overall: 6 letters, 5 letters, 7 letters. Six was the lucky number in 2012 as well.